A Wheelchair User's best friend! These Pets Add Charm To Your Wheelchair! Perfect for any wheelchair armrest 12 inches (30.5cm) or less! This fluffy puppy will add warmth to your wheelchair. This cute duck will quack you up! He loves to monkey around! Our frog looks much cuter in real life. You can not keep your hands off of those cute bunny ears. From the arctic circle direct to your wheelchair. How can you resist? 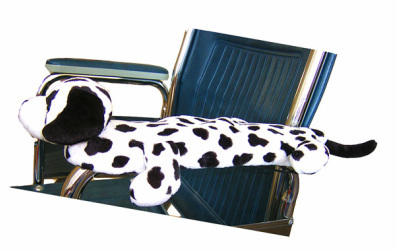 These wheelchair armrest pets will fit any wheelchair armrest which is 12 inches (30.5 cm) or less. This is MOST wheelchairs. However, to avoid disappointment, please measure the armrest before ordering below. Remember: The price is for TWO pets (one for each armrest). To order, first select your pet or pets using the menu below and then click "add to cart". We ship WORLDWIDE!